Let’s face it, commercial environments come with a lot of dirty jobs, including figuring out how to keep your furniture, drapery and other upholstered items clean in the face of dirt, dust, oil, stains and constant exposure to gross odors. Our Phoenix commercial upholstery cleaning services is a smart choice for all kinds of business environments, including office buildings, daycare centers, churches, industrial facilities and banquet halls, because we have the gentle yet effective formulas and equipment required to eradicate the toughest stains and odors. If it’s upholstered, KIWI Services can clean it. Why Choose KIWI for your Phoenix Commercial Furniture Cleaning? KIWI commercial upholstery cleanings are generally completely tax deductible, saving your business money that you can use to reinvest. We’re licensed, bonded and insured to reduce the risk of premiums, such as worker’s comp claims, associated with in-house cleaning and maintenance. Clean and fresh upholstery, furniture and drapery means a more welcoming place to do business, plus an enhanced company image. You save big when you choose to treat and refresh your commercial seating when compared to the costs associated with buying all new furniture. 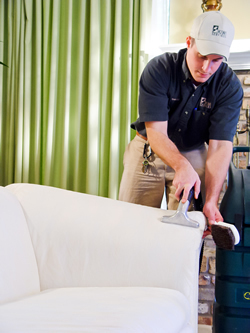 Although it may seem simple, commercial upholstery cleaning is actually a complicated science. We have found unique, safe ways to completely scrub away stains and dirt buildup without compromising the furniture or drapery’s detailed patterns, construction or dyes. Many people don’t realize that not keeping up with your upholstery cleaning can actually damage pieces for the long term, because microscopic pieces of dirt and dust can cut, damage and stain the fabric. Our Phoenix commercial cleaning services leave your pieces smelling fresh and looking great. Contact us today for a free evaluation and quote.